The situation of ground water is critical in Delhi,Punjab,Haryana and Rajasthan. Oceans cover three-fourths of the total geographical area of Earth and the total volume of water on Earth is estimated to be around 1.4 billion square kilometers. But the unfortunate part is that ground water,which can be used by people,constitutes only 0.8% of total water volume while the rest lies in the form of oceans and snow on mountains and glaciers. A growing population combined with huge demand of water for development purposes has put excessive stress on available water resources. The uneven distribution of water-resources,artificial modification of natural flow of rivers and human abuse are the main reasons for the looming water crisis in India. Bihar and West Bengal have the lowest per capita length of rivers and canalsless than 4 centimetresone of the primary reasons for the non-availability of water for irrigation purposes and the falling agriculture sector in these states. Nearly all the states except Karnataka have been found to be suffering from the problem of deficient and scanty rainfall in their region. The worst affected among the states are Delhi,Sikkim,Uttar Pradesh,Rajasthan & Chhattisgarh. The stage of ground water development reflects the usage of water with respect to availability of water resources in the region. 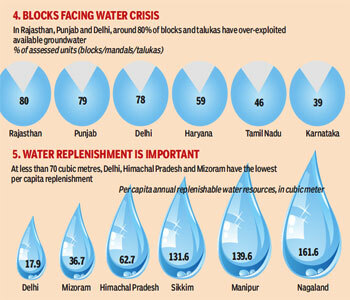 The situation of ground water is critical in Delhi,Punjab,Haryana and Rajasthan. It becomes more evident from that fact that more than 50% of the assessed units in these states are found to be critical or over-exploited with respect to the availability-usage situation of water resources. These states need urgent attention from the government and the implementation of proper water management techniques to prevent severe water crises. 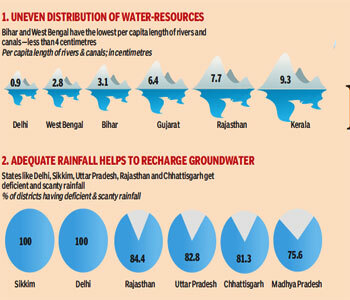 States like Himachal Pradesh and Mizoram have the lowest per capita replenishment of water,less than 70 cubic metres. Looking deeper at the future demand of water,it is interesting to note that the demand for water is going to be doubled in the next 15 years in many states. This raises an alarm bell for all stakeholders to take adequate steps to control water abuse and the storage of water for future usage.